For the last couple of years I’ve been eyeballing consulting as a potential next-phase for the career I’ve built as a photographer. I’m not ‘done’ with photography, by any stretch. But, it would be foolish not to see the writing on the walls. The value of a consumer photographer’s work is justifiably diminishing. Like any business owner or entrepreneur, I’m trying to make it for myself. People choosing a path like I have need to find the nooks and crannies where our skills will fit and make an impact that can turn into a livable income. We can’t count on the ‘job’ being there for us; we have to build it and make it one day at a time. Consulting has always been an attractive concept to me. I love to learn new things and I excel under pressure. I’m energized when I can form connections between disparate information, and put pieces together to improve my condition, or the conditions of others. In a general sense, that sounds like a recipe for satisfying work in consulting to me. So, I recently read Getting Started In Consulting, mostly just trying to get a clearer idea of what working consultants actually do on a day to day basis. Unfortunately, I was disappointed by that one. It focused heavily on the practicalities of starting a new consulting firm, and made some assumptions about the reader’s existing experience with consultants. It wasn’t without it’s useful information, but they were tidbits, while the meat was mostly irrelevant for my current state. So after finishing that one, I dove back into Amazon to find something more relevant. 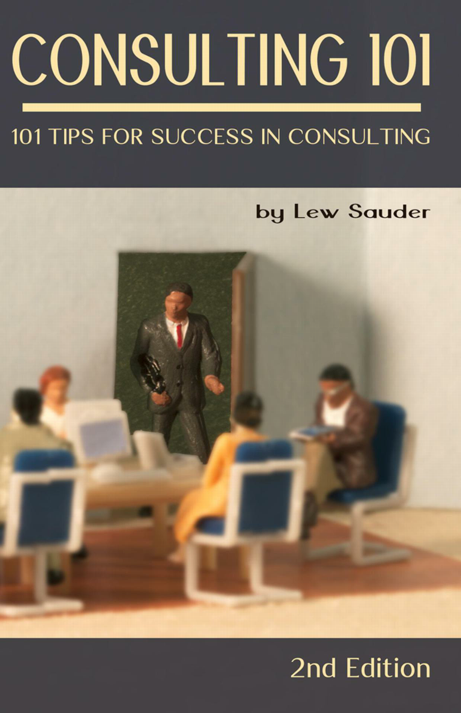 That’s when I found Consulting 101, 2nd Edition: 101 Tips for Success in Consulting. Consulting 101 was much more in line with what I was looking for. It’s a collection of short stories that illustrate the demands and expectations placed on consultants working for established firms. The author calls them ‘case studies’, though some fall short of this description. There are 101 (shocker) 2-3 page sections, most of which begin with a narrative involving a new consultant, and end the narrative with that consultant royally mucking it up. I liked the book’s granular format, focusing on things not to do. It’s not especially difficult to imagine what a consultant might need to do—finding information, figuring out how to apply information, finding flaws, optimizing routines, so on and so on and so on. But it’s quite a bit more challenging to imagine how to do those things the ‘right way’. Or, the way that a business would want you to. With each small chapter, it was fairly easy to conceptualize the larger contexts, so the faux pas described made intuitive sense. The There was one aspect of consulting that the author repeatedly described, and which I constantly but heads with: abuse. Apparently, it is common and accepted behavior for the employees of a client to behave abusively toward consultants while they are on site. From my perspective, abuse is essentially always unacceptable. It doesn’t matter how much I’m being paid, I will not tolerate abuse, and my contracts as a photographer explicitly penalize clients who engage in abusive behavior. I kept wondering—do consultants not have contracts? Don’t those contracts have clauses dealing with abuse? Does abuse not compromise the consultant’s ability to provide the service they are hired for? It certainly does as a photographer. Perhaps I am yet naive, and I do not know what I don’t know yet. But from my perspective as it is now, I appear to have a fundamental incapability with the industry I am flirting with. Still, however, I will continue down this path to see where it leads. Consulting 101 was a useful book to read for my current mullings. It’s billed as a book for people recently out of college, or who are planning to make a shift from an employment position to a consulting one. And, for those folks, I think it’s worthwhile. Though, I think for myself, more voices and perspectives are needed to discover if there’s a place for me, personally, there.